You are going to love these! The chunky lip pencil comes with a built-in sharpener. 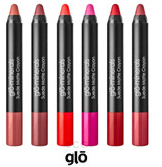 You can line and/or fill with these - they are a liner and lipstick in one. Don't worry about needing to sharpen when you are not at home...the sharpener is built in. Plus, (and this is a big plus) these rich colors are enriched with antioxidant vitamins C & E and Mango Oil and Shea Butter. Your lips are definitely protected as well as beautiful. Suede Matte Crayon comes in six vibrant fall colors - $16.00 each! For some reason, I assumed that matte lip products would be drying. But the ingredients in these (mango oi & shea butter) would be to differ. I also love that they are both lipstick and liner in one. Not to mention the built in sharpener. Genius!